Listen to an online police or fire scanner stream for two hours and document what you hear. Specifically listen for codes, protocol and other methods of communicating complex information. Blog your report and post the link as a comment to this blog. 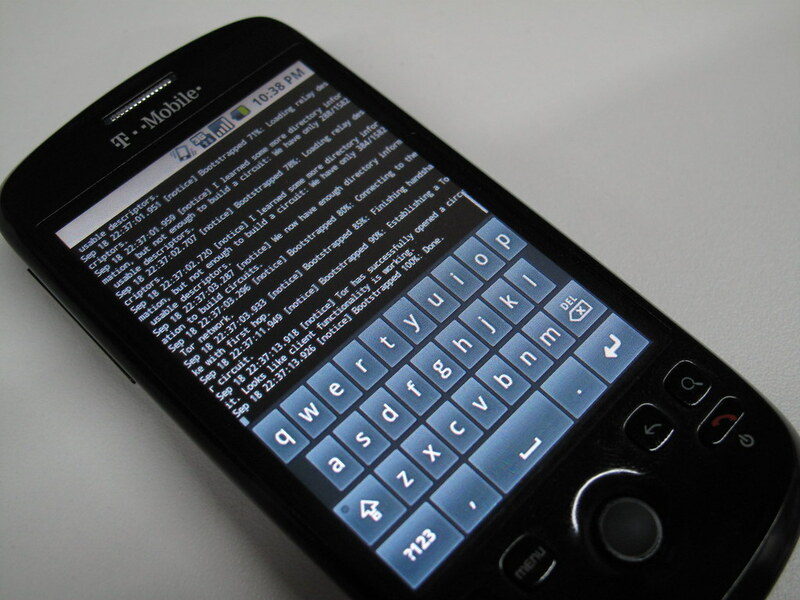 Invent your own spoken, typed or visual image code, along with a reason for its use, that could be communicated through a mobile device using texting, image sharing, bluetooth or any other aspect of the mobile device. Document this code, post it to your blog, and share a sample of it via 41411/ITP2800, on Twitter #itp2800 or another mobile medium of your choice. I announced my work in porting the Tor Project to Android. Tor is an “onion router” web proxy that allows web surfers in places like Iran and China get free, anonymous access to the web. Having secure, anonymous browsing that can route around censorship is a critical component of my Guardian secure smartphone project. The story of Alan Turing and his impact on computing came up briefly and I just wanted to make sure everyone knew the amazing yet tragic story of his life. Just recently, an online, crowd-sourced petition effort pressured the British Government to issue a formal apology for causing his suicide, and countless others who were persecuted for their sexuality. At some point in class, I drew a diagram that I quite enjoyed sharing, and will attempt to recreate here, since I unfortunately didn’t get a photo or capture it using the smart board. 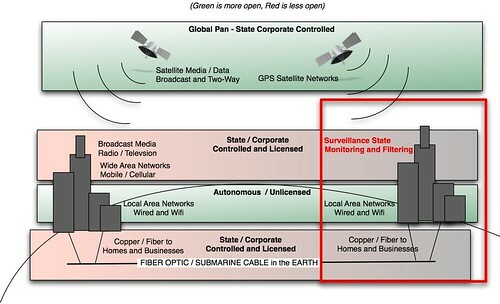 The drawing below is an attempt to demonstrate the various layers of network communication layers, both the physical medium and the amount of government/state and corporate control at each layer. Ultimately, the best opportunities for using networks with less control lie at the LAN layer and the Global layer…. though there are opportunities and technologies at all layers. I also realized that I hadn’t given the class a background on myself, and decided to share a talk I had recently given at Parsons on my life and work. The presentation tells my story through the various computing hardware and devices I’ve owned, used, hacked and programmed in my life. Notice that the devices get smaller, more powerful and more connected over time. The slides are posted below, and then a video from the talk I gave at Parsons is below that. Finally, we reviewed week 2 homework, specifically “mobile videos shot under duress” and the first draft of proposals for the cause they’d like to work on and the technology they plan to use. You can search #itp2800 on Twitter and ITP2800 on Delicious to see links to some of the homework. That’s all for week 3…. leave a comment here if you have any questions or feedback. I was actually introduced to Alan Turing and his life's work through Neal Stephenson's Cryptonomicon. It's an awesome book and although it's fiction, it still draws on many real historical people and events. To people in the class that haven't read it, I highly recommend! I listened to a police scanner and also heard that weird Morse Code beeping, but I thought it was a printer or something. I asked in class if anyone had read Cryptonomicon and no one had. Glad to know there is at least one!